With the prices of high-street fashion going up and up and up (Topshop is ridiculously overpriced now - don't even get me started) what used to be a quick dash into a shop and grabbing an easy to wear party dress is more often then not, out of the question. Another factor of time (and effort) can often be a 'no way am I going through shopping rush hour for one thing I probably won't wear again' which is perfectly understandable. This is when the investment pieces come out to play. Your wardrobe shouldn't be a jumble miss-mash of different garments you like to wear, but a capsule collection of timeless classics that are investments into your fashion future. Trends are great and having a few 'trendy' items isn't a bad thing, but with the rapid turn over in seasonal wear, staying up to date with everything is an expensive job and will leave your wardrobe heaving with 'so last season' clothes. If you are a trend watcher there is a solution to buying fad-fashion, as everyone who knows anything about fashion and trends is they all come back around. We've seen it all before... The 90s, Monochrome, Pastels, Florals, Bohemia Chic, The Great Gatsby Wanna-be. There's not a lot that can be seen as 'new' in today's society. So with so much recycling having some one of items that can see the sunlight every now and then should be something from each trend you would wear and make sure they can be worn with other-things all year round. Such items may include: a fringed bag, a maxi-dress, an oversized knitted jumper, John Lenon styled sunglasses, a tie-dye shirt etc. Shop my 'fad-fashion' items here for you're simple go-to's for metallics, trainers, logos and all that jazz. (Including beauty, accessories and jewellery). All of the items have duel-trend value (meaning they suit more than one trend at a time) so they are useful ones to have as they will be used again, rather than gathering dust at the back of your storage. These items can suit a multiple set of tastes and of course will not be worn forever at all times... these are items to whip out when the new 'in thing' hits the magazines. Note: Some are more simple than others - such as dark denim for those who aren't crazy adventurous with their look. BUT... Back to the main point of this post is HOW TO MAKE OLD ITEMS INTO NEW OUTFITS. They may seem boring to you, because you wear them to every event and occasion or they are your day to day basics, but it's easy to break the style rut of constantly turning up in the outfit you wore last time. I'm always getting compliments from people about items they see me in all the time, however they look new to them from the way I wear things. So here are the capsule items that can work in more ways then one. 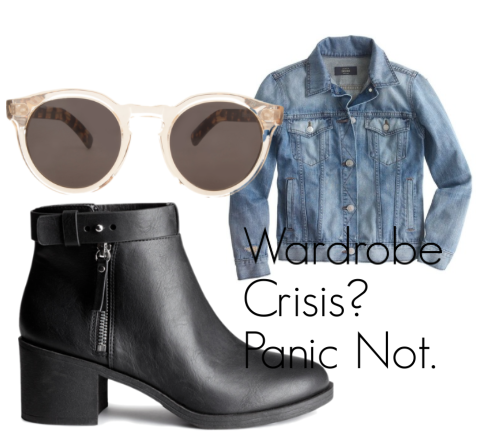 You can shop some of the key staples items that should be in your wardrobe if you don't have them already - you will probably find they are the things you always wish you had when trying to find an outfit. So say goodbye to the whole 'oh this outfit would be perfect if I just had...' or 'I really wish I had (insert here) to go with this dress I bought, I don't have anything in the right /shape/colour/size for what I want to wear'. Think about the basic primary and secondary 'block colours' as well as the typical black, white, grey and brown. So have a few splashes of bright red, electric blue, emerald green and purple to really make your wardrobe come alive. Remember these are INVESTMENTS so you should pay more than you would for any fad trend, because you want a high quality finish that's made to last. Whether it's that small night out bag or the 'work out wear' that you will be wearing at the gym or running errands. These items are ways of working trends into everyday wear without looking like you're trying to follow 'prints' or 'nudes' etc. Don't buy things that don't suit your body shape or size, as no after how much time pasts it will not suit you. Really concentrate on what your body looks good in and avoid at all costs what doesn't work for you. Choose flattering silhouettes that you are comfortable and confident in, it will make you look much more stylish (as well as suiting you). Note: These are the basic item ideas to think about, such as an animal print shoes, classic black heel, staple work bag etc. The following examples are just inspirations for the key items and ways of making them versatile. 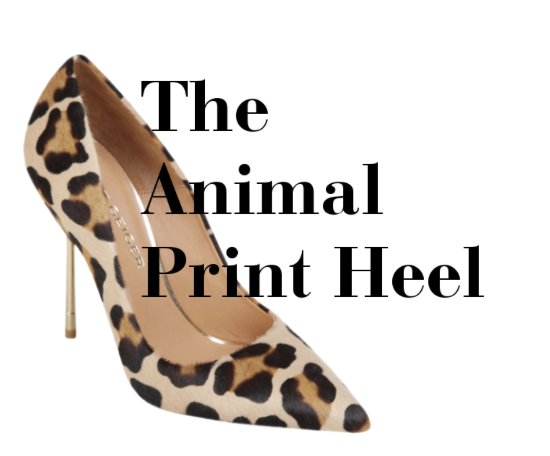 This classic is one that doesn't need to be part of the 'safari/khaki' trend that seems to hit every August time, with a leopard or snake print heel you can add a touch of glamour and class to the most simple outfits. Whether you're into skirts and dresses or keeping it really relaxed, these shoes can be easy to make a statement with a simple pair of jeans or can just be an added element to a put together look. I have also included a flat option for those who hate heels. I am a sucker for a nice lunch or brunch if you're an early bird with my friends or having a breakfast meeting to discuss new collaborations and ideas, but choosing an outfit that is both 'office chic' but also 'I just woke up an threw this on' can be a difficult look to master. This is my go to when it comes to that effortlessly put together combination. Whether you're out shopping, just meeting a friend in town or going out for a nice walk with your dog, I always opt for a comfortable loose T-Shirt and denim shorts in the summer. Pair it with a funky backpack and some large black sunglasses and you know that despite the casual look, you have the wow-factor thanks to the printed shoes. A bold choice for some, but an easy one to fall into the 'one outfit only' trap. 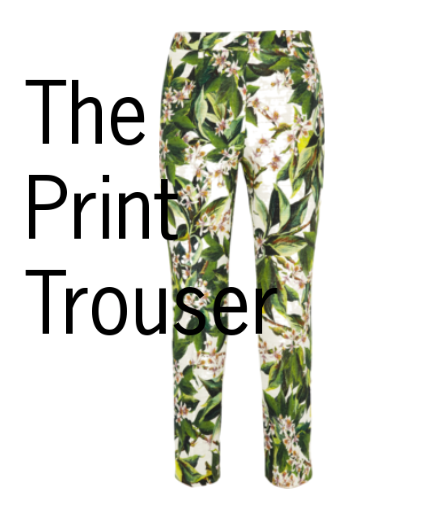 Print Trousers are not to be feared, but to see as a statement to your personality. Pick a simple print (no aztec, no butterflies or anything please... grown up choices) that won't go out of style such as stripes or polka dots and you will be safe to wear these again and again. Even when you're just meeting your friends for that very-much-needed-how-have-we-left-it-so-long catch up (you all know what I'm talking about) when you walk through the door you still want to look presentable and like you've made an effort. Even if they are your friends, you still want to show them that you are still alive and fabulous and that you have made an effort for them, they may love you regardless but you want to show that you care about them by making a presentable appearance with yourself. Meetings don't mean that you always have to wear a trouser-suit. Power dressing isn't about shoulder pads anymore and there are ways to show you mean business without a pencil skirt. Shocking I know. So if you find yourself needing a quick outfit that shows you are an independent woman *snaps fingers* who knows her stuff, they try the combination of a nice jumper with a statement necklace and stiletto heel. Throw on some large sunglasses and a large bag to match and your trousers now look more in tone with your look. Every person who works from home and has made a success of it will tell you the same thing, to find the motivation to get up and get on with the day you need to wake up and get dressed for the days tasks, just like if you worked in the outside world. I personally feel more confident in what I'm doing when I feel 'in character' with what I'm wearing. So if I'm having a day where I will be superglued to my Mac, then I like to make sure that I dressed for that. Being sat down is also a greta excuse to wear those heels that you love but kill your feet if you were to walk a few steps in them (we all know you have a pair of those - what girl doesn't). It is also a great way of being organised and looking ready if you need to pop out and run some errands, picking up and dropping things off, or if someone unexpectedly pops over, do they really want to see you in your pyjamas? No. There are so many different colours to wear print trousers in, be it for work or pleasure, these loud garments suit picnics in the park or an afternoon meeting. They show you to be confident and lively, so perfect for a happy mood booster! And no matter if you suit a cigarette fit, a skinny/loose fit or wide leg there is something for everyone (Just try to avoid leggings unless you want to look like a 14 year old influenced by her friends). Everyone has a pair, and everyone will always wonder what else it will go with. How can such a casual item be for anything other than the weekends? Fear not. 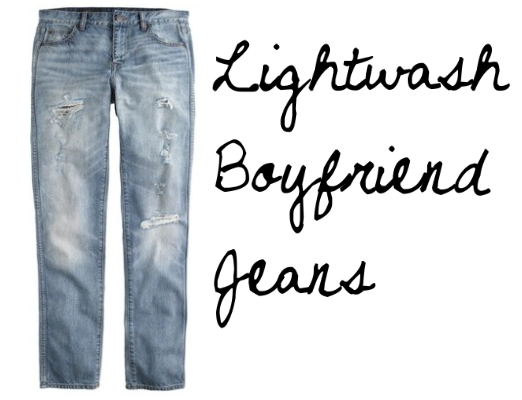 You can make your Lightwash Boyfriend Jeans perfect for the evenings with a blazer, chic ponytail and a small clutch. Light denim won't suit everyone and this is definitely not a style that everyone should consider, but if you do have a pair knocking about in your wardrobe then pull them out and start mix and matching some of these ideas together! No one has days where they never feel they are lacking effort or energy. We all have mornings where we wake up and just cannot be bothered with anything. But that doesn't mean you have to sit around feeling rubbish in a baggy T-shirt and some leggings. Now is the time to chuck on those jeans and a comfy top with some canvas flats that require the most minimal amount of work. There's always those glorious days that happen once in a blue moon, where you find you've been organised enough to do your work on time and have a day where you're pretty much free to do what you want, whether it's just go out and enjoy the weather or you get to do something fun for yourself or even those extra jobs you haven't found time for. It's the perfect opportunity to put down the heels, relaxed and just feel comfortable. It's always nice to be called up and asked out for lunch or asked if you're free suddenly, and that can lead to a sudden rush around to find a suitable outfit for an unplanned activity. However when it's a daytime date, you don't need to go overboard and reach for an evening dress. Keep it simple with some nice heels and necklace and let your fun personality be the reason they want to see you. Stay comfortable in a pair of jeans and top and just enjoy yourself. These are a really versatile item once you have the right accessories, you can make them look smart and sassy or keep it cool, whether it be with heels or flats. There really is no limitation to what looks you can achieve. I hope you found this post helpful and insightful, giving you a new perspective when shopping (you should notice you impulse purchase less and save more money by not spending). Obviously there are more than these three items, however this was already a very long post, so I hope you can understand why I stopped at three! If you would like any more tips and advice tweet me @b_arose.